San Diego, CA –May 7, 2015– San Diego-based Suja Juice Co., the fastest growing cold-pressured, organic juice & smoothie company in the U.S., is entering its second year as title partner of the 18th annual Suja Rock ‘n Roll San Diego Marathon & ½ Marathon, which takes place the weekend of May 29-31, 2015. More than 30,000 participants will enjoy various Suja Juice experiences over race weekend including a lounge with drink samples and a hair braiding station at the Health & Fitness Expo on May 29-30, a special Suja band performance on the marathon course, and a finish line recovery center featuring yoga and stretching. After the race, runners can relax and rejuvenate with full-sized Suja samples inside Petco Park at the Toyota Rock ‘n’ Roll Marathon Series Headliner Concert featuring O.A.R. In addition to O.A.R’s headlining performance, runners will also enjoy the sounds of live, local bands playing along the course as motivation and entertainment, along with thousands of enthusiastic cheering spectators. New this year, race weekend will feature a second day of running with a Rock ‘n’ Roll 5K on Saturday, part of what’s dubbed the Remix Challenge. Runners who complete the 5K, plus the half-marathon, marathon or half-marathon relay on Sunday will receive a medal for each race, plus a special Remix Challenge medal. Sunday’s marathon, half marathon and relay start in Balboa Park and finish at Petco Park in downtown San Diego. The marathon course travels through Little Italy, Mission Bay, Bay Park and Old Town—running almost completely separate from the 13.1-mile course. The half marathon ventures all the way up to Normal Heights and through many of San Diego notable neighborhoods, with the majority of the course wrapping around Balboa Park. 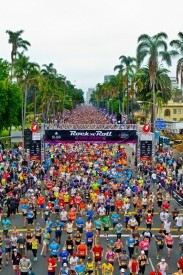 For more information on the Rock ‘n Roll San Diego Marathon & ½ Marathon please visit runrocknroll.com. To learn more about Suja Juice, please visit sujajuice.com. Suja Juice™ began from a shared dream to help people transform their lives through conscious nutrition. The three handcrafted lines of cold-pressured juices, Suja Classic™, Suja Elements™ & Suja Essentials™ are Certified Organic and verified Non-GMO by the Non-GMO Project. All juices and smoothies are cold-pressured using High Pressure Processing (HPP) to kill any harmful bacteria and preserve maximum nutrition and taste. Suja Classic™, packed with pure fruits and vegetables, is the convenient way to drink nutrients the body needs and maintain overall health. The Suja Elements™ line gives back — with each bottle purchased, 20-25 cents is donated to an important cause. In 2014, Suja introduced its newest line, Suja Essentials™, which delivers functional refreshment with vital nutrients your body needs like amino acids, antioxidants, proteins & omegas. With a wide range of cold-pressured organic offerings, Suja™ has a juice for every lifestyle. Suja can be purchased at major Grocery, Natural & Mass retailers nationwide, as well as on SujaJuice.com. For more information on Cold-Pressure Technology, please visit www.ColdPressured.Org. The 18th annual Suja Rock ‘n’ Roll San Diego Marathon & ½ Marathon to benefit the Leukemia & Lymphoma Society will run through San Diego over the weekend of May 29-31. The race is known for lining the course live bands and cheerleaders interspersed with themed water stations along each mile of the route. The original Rock ‘n’ Roll Marathon in 1998 is still recognized as the largest inaugural marathon in U.S. history with 19,979 entrants.